The interview taken by Anastasiya Karlovich on the day after the decisive 7th game of the Women’s World Championship Match in which Yifan beat reigning Women's World Chess Champion Anna Ushenina of Ukraine, the 19-year-old World Champion talks about her preparation, her opponent Anna Ushenina, the match and her attitude towards chess and life. When I saw you in Beijing in July during Grand Prix tournament it seemed you were not really busy with preparation for the Match. Was it just my impression?Actually I started my preparation few days after I came back from Tromso. In total it lasted less than one month. The only difference in my preparation was that I knew my opponent and it was a bit more specific. We didn’t have much time, so we worked on some basic things, some openings. There is an opinion you don’t really try to outplay your opponent in opening. 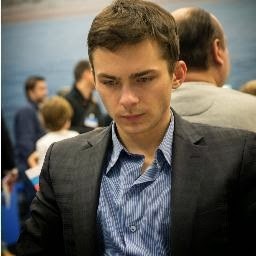 Do you try to prove you are better in middle game and endgame, same way as Magnus Carlsen does? Carlsen is famous for being very powerful and much stronger than most of the players in the world in the middle game and endgame. I’m not such a high level player. I believe openings are important but for me it’s also not the most important part of the game, it’s only the first stage and then we have two more. What do you think about your opponent? I think she is a strong player. We’ve played several games in the past but for few years we didn’t play at all. I thought if she managed to win the World Championship in knockout it means she is a fighter, she cannot be weak. After few years break you had a chance to play against Anna during Women Grand Prix in Geneva and you lost that game. What did you feel after? Did you make any conclusions?At that tournament I lost not only against her, I also lost to some other players. The most important thing was my bad performance, I was not in a good shape and played just terrible. This game didn’t change my attitude to match, in any case I was going to prepare seriously as I try to do before any official event. Anybody who plays not only for fun should pay attention to preparation. How can you explain your results during the last year? Was it in some way connected with the forthcoming match? I was not in a good shape for a long period. I don’t really know the reason but I thought it was normal in sense that in one moment it was supposed to happen. You cannot always play good and show great results. It also could happen here but what can you do about it, except trying to do your best to get ready for the tournament. I cannot also say that I put too much attention to the match and I didn’t care about other tournaments. No, my results were not connected with the match. 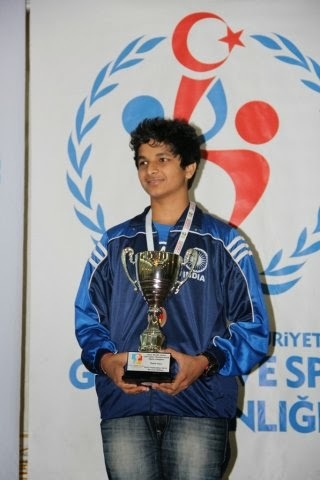 In 2011 I showed good results before the match with Koneru, so I think I just had a bad period. Did your results during the last year influence your self-belief?I’m not the person who cares so much about the results, even I take chess seriously. Was this period connected with changes in your life? As I know, you started to study in the university.Yes, I cannot take so much attention to chess as I did before because I have to study as normal student. The only advantage I have is an opportunity not to attend lessons when I participate in the tournaments but I still have to study myself if I miss something. Also it depends on professors, if the person is quite strict and pedantic so I cannot miss a lot. What did it mean for you to play in Taizhou? What do you think about conditions? Is it important to play on “your field” as in football? In fact, Taizhou is not my native city. I was born in Xinghua, it’s one hour by car from here. Xinghua has at least 1 million inhabitants and many of my relatives still live there. South of China is not so polluted; there is a fresh air here, better food, vegetables. 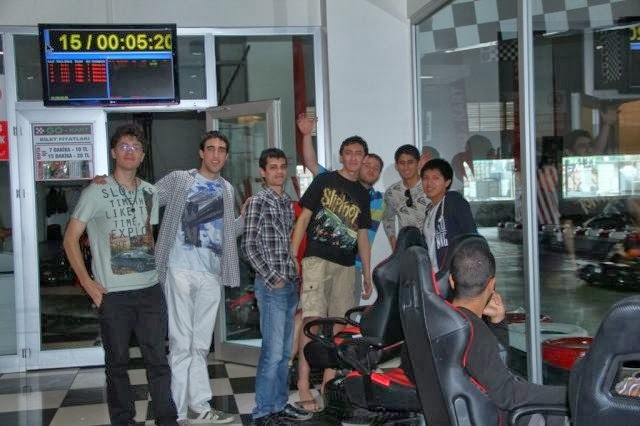 Of course, while playing here I didn’t need to change my schedule due to time difference and food was okay for me but in general I think the organization was more or less the same as for any other chess event. What was your reaction when you learnt that Korobov and Khalifman were going to help Anna Ushenina during the match? At first when I saw her team I said as many other people did: “Wow! Her team is so strong and so powerful!” I thought at that moment: “Maybe I should be more serious about it? Maybe I should do something different?” (smiles) But then after Tromso I just decided to hire a second by myself to help me preparing. Did you expect the match to finish so quickly?Well, I was expecting any situation. I expected it would be difficult, or I would have some difficult moments. Can you tell which difficult moments did you face during the match?The first game was very complicated and the fifth game also. How did it happen that Anna lost three games with white pieces? Do you think it was because of wrong opening choices?In first two games there was Nimzo-Indian, my main weapon with Black. She didn’t lose those games because of openings. It happened later. I can only say that in the third game there was an obvious mistake made by her. Are you satisfied with the level of play you showed here?It’s okay for me but not perfect. I didn’t make big mistakes, I didn’t blunder but I also didn’t play precisely sometimes. I had worse positions in the games I’ve mentioned and I think it was because of my inaccurate play. You had already won two matches – one in Tirana against Humpy Koneru and another one just one day ago. How can you compare them? I felt happy two years ago and I feel happy today because in general I’m glad to win such important tournaments. The match in Tirana was more difficult for me. Last time the first half of the match I had worse and difficult positions and I tried hard to fight back. This time it was more one-sided. At the same time this match was not as easy as people might think, judging only from the outcome. In Tirana I faced more problems in the openings comparing to this match but it’s hard to say if I was better prepared in the openings for this match or not. You had health problems in Tirana. Have you ever had that unknown pain in stomach again?Sometimes I get sick during the tournaments. During this match I felt okay, but I had problems just few days before the start and had to take some medicines for 4-5 days. Who was helping you this time?I didn’t have a team this time and as I mentioned before that I only hired a second short time before the match started. Also you may know that GM Ye Jiangchuan is our Chinese team’s chief coach, so when he had time he also helped me a bit but most of the time he had many other jobs to do besides preparing. That’s why finally I decided to hire a second by myself. 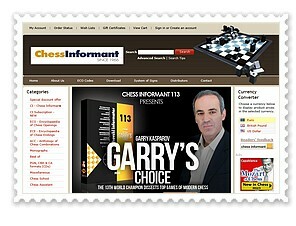 And a lot of friends all around the World were helping me whether with advises in chess or just support. They were cheering me up and I feel very grateful. I really appreciate their help! How do you mentally prepare yourself for the games and for the match?Of course, I considered this match as a very important event but it’s not the most important thing in my life. For me it’s more important to be healthy, to be happy person in my daily life. I will try to explain you another way. Health and happiness means number “1” for me. Achievements, victories are “zeros”. So I would add those zeros to number “1”. The total number of my day can be 10, 1000, 10000 but without number “1” it’s nothing. 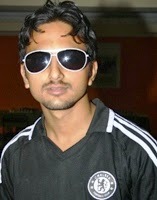 I think my attitude helped me to enjoy the match and feel good. I try not to make a tragedy if I lose a game. Until the match is not over I would just focus on following games. In general when you win it doesn’t mean something crazy, if you lose it’s not the end of the world. But what if you lose this match? Yes, I thought about it before the match and for me both cases were acceptable. I know many people contributed to organize this match, I appreciate the help of the government and the organizers, but still all results were possible. I was just trying to do my best and to be optimistic. 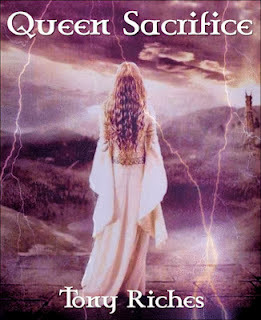 What does this title means for you? How is it important for you to get it back after nine and half months? I’m happy to get the title of the Women’s World Champion back. Last year my results were not so good and I hope it’s a signal that I started to recover. Do you feel you are the strongest player among women? No, I don’t. There is no obvious difference in level between me and other players. 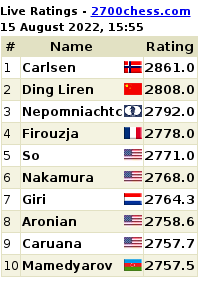 There are many strong players who have rating over 2500 and with some of them I have a plus, with others balanced results. At the same time I don’t have an opponent among women I have difficulties to play against. Does it bother you that you can lose your title in the next World Championship with knockout system like it happened to you in Khanty-Mansiysk?I have no idea if I’m going to play there or not, I don’t have clear schedule for the next year. You may know that I didn’t really want to participate in the World Championship but had to go to play because of other reasons in the end. I don’t have clear idea which system should be used in women’s chess but we can compare it with the system in men’s chess. I believe the organization of whole cycle in men chess is more reasonable, fairer. 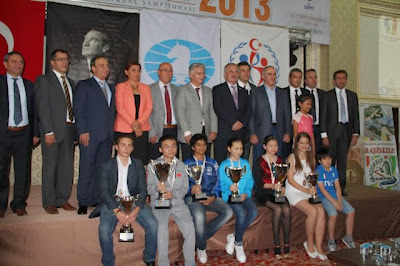 I would be glad if FIDE makes the same system for women chess. You are young, beautiful and the World Champion! How can you describe your life at the moment?It’s still long way to go and I have many years ahead to do almost everything I want. It’s time to observe the new things in chess, in studies, in other parts of life. I just want to expand my life. Life is wonderful! Kocaeli: Grandmaster Sahaj Grover (left) played out a draw with Iranian Pouya Idani, while Vidit Gujrathi defeated Polish Marcel Kanarek to be joint third after the eighth round of the World Junior Chess Championship here. On what turned out to be a mixed day for the Indian boys, Gujrathi was at his technical best to squeeze out a victory with black pieces. The middle game arising out of a Taimanov Sicilian was about equal and Gujrathi reached a queen and minor piece endgame where he began perfect deployment of forces to win a pawn. Kanarek went looking for counter-play but ended up losing his queen in a tactical melee. Grover fell short of time when he needed it the most in another Sicilian Taimanov of the day. Pouya Idani was quick to spot a tactical stroke after suffering for the major part of the game and Grover could not find the right path to exert pressure with his clock ticking away. The result was a draw after Grover suffered some material deficit.S.P. 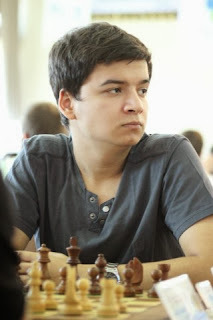 Sethuraman could not match the guile of defending champion Alexander Ipatov of Turkey and lost from a position of strength. It was a promising middle game for the Indian out of a Queen’s gambit declined but Ipatov stayed focused to pose problems for white. As it happened, Sethuraman missed the thread of the position and lost a piece and it was soon all over. 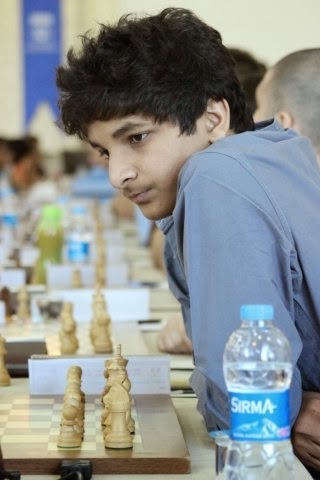 Debashish Das was the other Indian who lost from a drawn position against Vladislav Kovalev Belarus. Yu Yangyi of China shares the lead with Ipatov on seven points and these two are now a point clear of nearest rivals, Grover, Gujrathi, Idani, Kovalev and Jorge Cori of Peru who drew with Yangyi in the eighth round. In the girls’ championship being held simultaneously, Padmini Rout showcased her attacking skills to outwit erstwhile leader Aulia Warda Media of Indonesia. 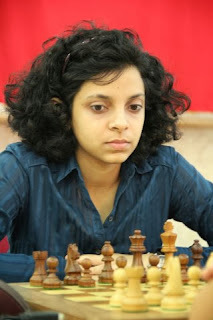 It was a French Winawer by Padmini as white that led to complexities favouring her. G.K. Monisha’s prospects of a norm suffered a setback when she lost to Lanita Stetsko of Belarus and the Indian will have to win a few games to come back in contention. Among other Indians in the fray, Ivana Maria Furtado also suffered a setback while Shristi Shetty and Anjana Krishna also lost their games. Riya Sawant and J. Saranya won while Rucha Pujari was held to a draw.